"Canceling" a trip is not a correct term to use here because we just had to postpone our trip. But I was very disappointed, so "canceling" seems to be a stronger word. So what happened? Back in May we decided to go on a cruise around Mediterranean sea. We wanted to do this for a long time and finally had the money and the time to do it. 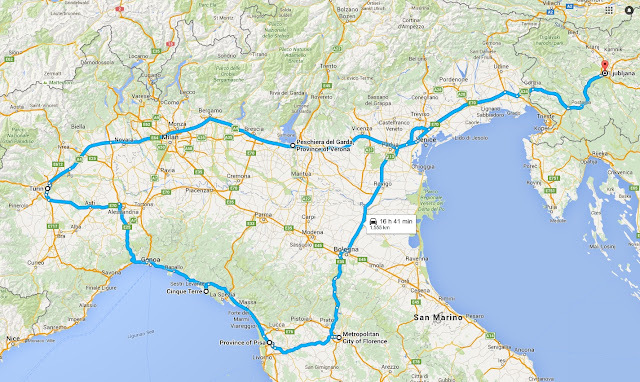 So we booked a triple room (for the three of us) in Costa Favolosa, which was supposed to sail in October this year from Savona in Italy, to Marseille in France, Barcelona in Spain, Citavechhia in Italy and back to Savona in a total of six days. At the time of the booking, I informed the agent that I was pregnant, and will be 30-week pregnant by the time we'd board into the ship. She said that was okay, as long as I'm accompanied by a fit-to-travel letter from my gynecologist. Which seemed logical, as air companies also let pregnant women fly up to 36-week of pregnancy if accompanied by a fit-to-fly letter. So we made a full payment and added a travel insurance. A week ago I was surfing the internet in bed when I ran into some travel forums on cruising while pregnant, where the ladies discuss about the ships' policies of not allowing pregnant women on board after 24-week. I checked on the official website of Costa, and they do mention that no pregnant women over 24-week are allowed on board. The same policy applies also for MSC and Carnival Cruises. I got panicked. And upset. I made my husband call Costa the next morning, and they confirmed that it's a valid policy for my own safety. However, due to the fact that I did mention about my pregnancy to my booking agent (who obviously was unaware of the policy), we're entitled to either full refund or reschedule of the cruise to after birth. The thing is, no baby younger then 6-month is allowed on board either. That means, we can only cruise in the summer of 2017 (my baby is due on Christmas eve this year). It's very upsetting to wait for another year, of a trip you've been dreaming the whole time! Now the good thing is, because we've paid the full amount of this cruise we now have to cancel (read: postpone), my husband thinks we might be able to save some extra money and make an upgrade, so we're now thinking about Costa Pacifica which sails in September next year and includes Ibiza in its itinerary. The rainbow after the storm, I get to plan some other trip. Because we already planned the free week for the cruise, we've got a free slot to do another trip. And after thinking of Malta for a while (we'd fly Ryan air from Venice), we decided to do a big Italian road trip: driving from Ljubljana (where we'll live by then -about this in another post) to Lake Garda, then to Turin via Milan, continuing our trip to the famous Cinque Terre, then to Pisa to see the leaning tower, and finishing it in beautiful Florence for a couple of days before returning to Ljubljana. I'm really not good in dealing with disappointment, especially caused by cancellation of a trip I have planned so well in my head. Waiting for another year for it to happen is another long torture for me. Moral of the story? Check and recheck the company policy before planning any vacation if you're pregnant (or planning a pregnancy). Planning a trip far ahead, yay or nay?